The Blue Maid Holly hedge is a relatively low-maintenance hybrid holly that grows best in moist and well-drained soils. The plant is evergreen hybrid holly that most often is grown up to 8 feet tall, though occasionally significantly higher, and is ideal for hedging or creating an outdoor screen. The shrub is quite hardy and has snag-free purple-green foliage that looks lovely along walkways or as border plantings. The densely bushy plant has bright red berries and distinctive purple stems, which makes it looks fantastic under snowfall and throughout the remainder of the year. For a sturdy winter-friendly holly bush, the Blue Maid is an excellent choice. Also check out Ilex dragon lady holly hedge. Blue Maid Holly hedges ready for harvest. Blue Maid Holly hedges have nice red berries. Blue Maid Holly berries are bright red and attractive to birds. 2 year old Blue Maid holly hedges growing in the InstantHedge fields. 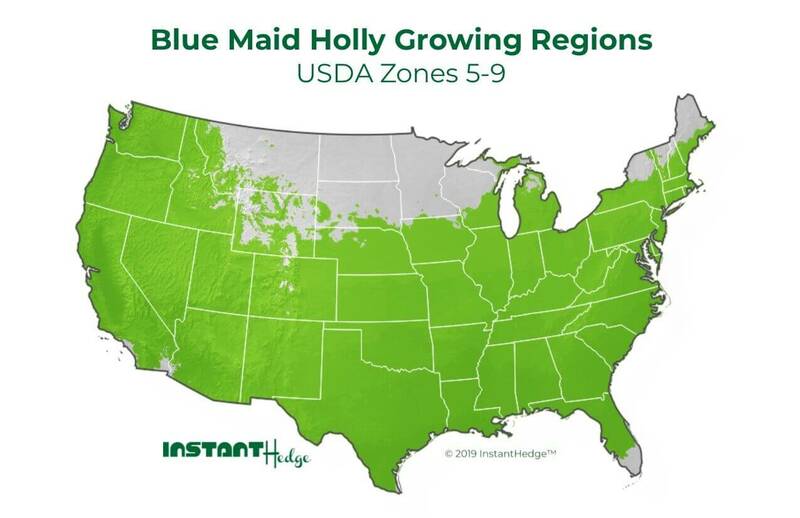 Blue Maid Holly hedges in production at InstantHedge. Blue Maid Holly has small white flowers in spring. Blue Maid Holly is a beautiful evergreen hedge with glossy green leaves. Pest/Disease Issues: Potential insect problems include holly leaf miner, spider mites, whitefly and scale. Potential disease problems include leaf spot, leaf rot, tar spot and powdery mildew. Outdoor eating areas are effectively separated from high-traffic areas with the use of an evergreen hedge. The shiny, deep green leaves of this holly hedge create a wonderful backdrop for the diverse garden planted in the foreground. A well-maintained holly (Ilex) hedge frames this residential outdoor space. With InstantHedges, outdoor living areas can have instant privacy without having to wait for individual plants to form a hedgerow.